SMS marketing system for any of your real estate listings, real estate searches and any mobile optimized real estate sites. Reach, engage and capture mobile home buyers through the RealBird Text Messaging Platform. All day, every day! 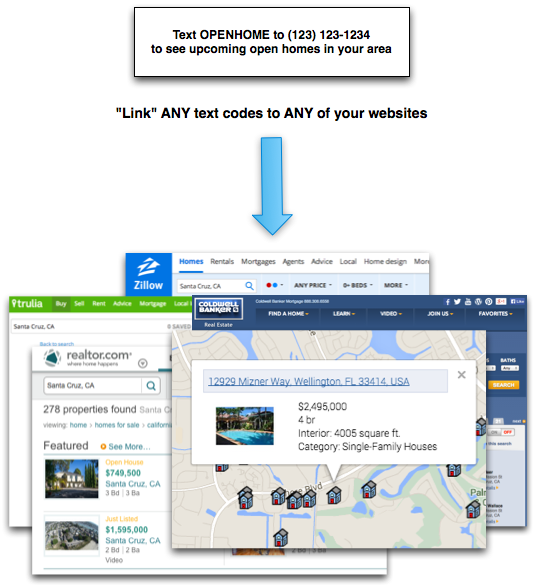 With the RealBird SMS AnyLink™ service you can set up custom SMS (text messaging) codes for any webpages, such as property websites, property searches, agent or listing videos, virtual tours, open homes and more. You are not restricted to use only RealBird Urls, you can link to any websites of your choice and RealBird will take care of the rest. Once you set up your Twilio phone number and configured it with the RealBird platform as described in this tutorial, you will be able to set up your text codes and the web pages that they link to using the easy-to-use editor. After your SMS codes are set up, just post your call-to-action messages on your sign riders, flyers or using the RealBird SMS sticker. When prospects text the code to your phone number, RealBird will automatically reply to them with your preset links and it also captures their contact information for you. Less than $10 per month !